We’re on the bus to ballet, Isla is sitting next to me and an elderly man and woman get on. I don’t notice their faces but Isla does and asks me, “why’s that man so sad?” (obviously loud enough for most of the bus to hear – except for the man in question, thank god!). I didn’t see him, but after a minute or two I turned round to look and admittedly he does seem to have one of those naturally sad looking faces, very down turned mouth and sad eyes. He doesn’t seem sad at all (he’s talking very animatedly with the lady) but it’s just his expression that Isla has taken to mean he is sad. 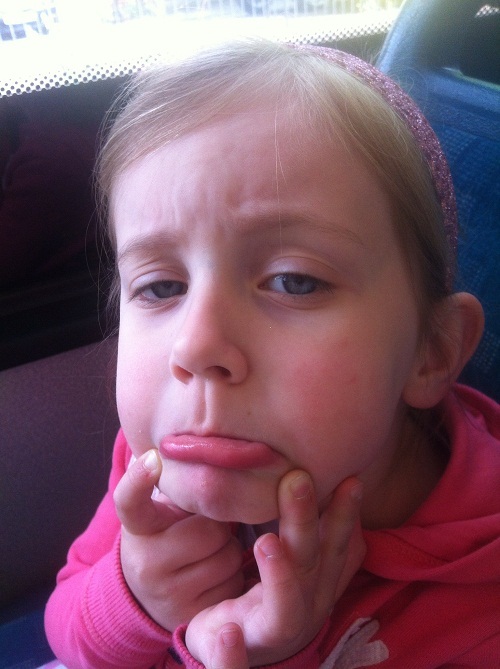 Just to make sure that I understand what she means she then goes on to pull lots of sad looking faces to demonstrate a sad face…..at this point I had to take a photo. As the man got off the bus he was talking to the lady he got on with and he no longer looks as sad, Isla seemed really relieved by it and told me “That man’s not sad anymore”……. Intermittently there was a return to the milk request. Met with a firm no. Then we have a conversation about the dustbin men, as he loves watching them out the window on Monday mornings. I explain calmly (although finding it hard to stay calm by this point) that it’s actually Wednesday and it’s around 1.30am by now and I don’t think they come at this time. Then we chatted about going to the park. Then we go back to the milk thing. “WANT WATER” – I nearly fall over at the shock that perhaps he’s serious and he wants water, give him water, he conks out and I go back to sleep. It was a hard week. I’m not going to lie but it has led to him sleeping through the night now and after a full 6 nights of sleeping through I feel confident that it’s dealt with. Thank the Lord! Yay!!! Go you! I was in your camp the whole time - I knew you could do it. It's bloody hard work though! 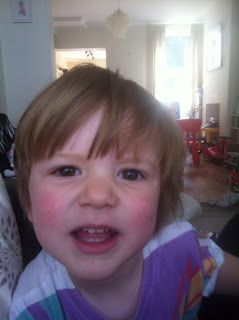 Two year olds can be very stroppy can't they?